TFI Envision Helps BBB Industries Welcome the Alliance to AAPEX | TFI Envision, Inc.
Las Vegas, NV — Nearly 5,000 automotive professionals from Aftermarket Auto Parts Alliance temporarily shut down Las Vegas Boulevard as they made their way from the Mirage Hotel to AAPEX 2018 in the Sands Expo, on Nov 1, 2018. AAPEX represents the $740 billion global automotive aftermarket industry. This event coincided with the Alliance’s Aftermarket Jackpot Convention that took place Oct. 30 – Nov. 3, 2018, at the Mirage Hotel. 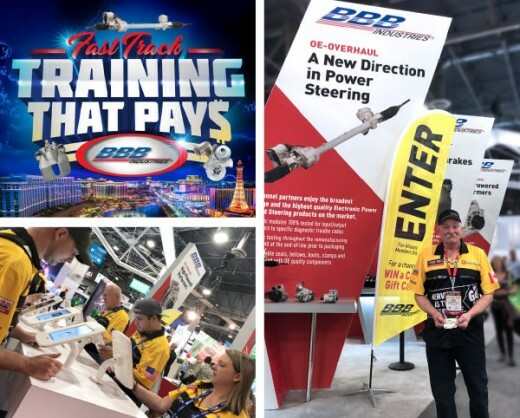 BBB Industries challenged TFI Envision’s creative team to create a buzz to encourage the Alliance members to visit the BBB Industries AAPEX 2018 booth for the opportunity to receive fast training and a chance to win ‘BBB Industries Fast Track Training that PAY$’ cash gift cards. Eligible participants were entered automatically into the “Alliance Aftermarket Jackpot” drawing. The more training sessions Alliance members completed, the greater their chances of winning. 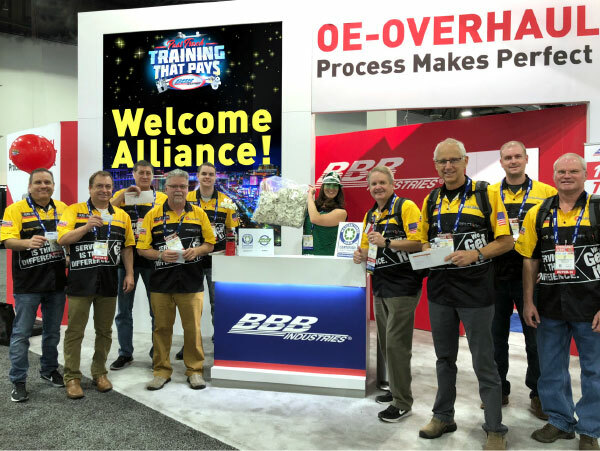 TFI Envision’s creative team worked together with the BBB Industries marketing team to develop a plan of action to transform their booth into a welcoming stop for the Alliance members. Starting with a the development of the “BBB Industries Fast Track Training that PAY$” logo, the TFI Envision creative team also created print advertising, social media posts, signage and banners for the booth, video spot for closed circuit monitors at the Mirage Hotel (where Alliance members were staying) and at the BBB Industries booth video wall, welcoming the Alliance members. TFI Envision also provided onsite photography and posting to the Alliance app to let them know what was happening real-time at the BBB Industries booth. BBB Industries was rated as the top supplier in Alliance visitor attendance at their booth based on badge scan volume and their booth was voted #1 “People’s Choice Award” during the Alliance convention. “Everyones efforts in planning and executing our Fast Track Training for Alliance Day, was a tremendous display of how BBB Team Members pull together to support our customers. A BIG congratulations and thank you – to everyone who helped make Alliance Day a success! ” said Gerard Yanuzzi, VP Marketing, BBB Industries.